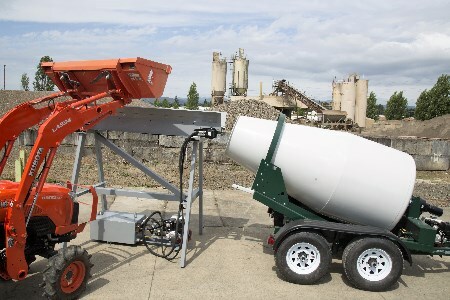 The Cart-Away Mini Belt Loader is a simple and efficient way to load a portable concrete mixer trailer. The bolt-together 7’ conveyor sets at just the right height to move the concrete materials into the drum for mixing. With a small tractor and this portable loader, you can start delivering ready-mixed concrete on the day the system arrives. This small loader, with a fast moving conveyor, can load one trailer or a fleet of trailers without stopping. It is also an excellent tool for those doing remote projects and need a robust portable concrete batching solution. The Mini Belt Loader uses hydraulic power, just like larger concrete batching equipment. Cart-Away has produced concrete mixing systems, like this small loader, since 1993 and they lead the mid-sized concrete batching industry. The conveyor system weighs less than 1000 lbs. and has a footprint of only 59” by 85”. The frame, conveyor, legs and hydraulic power unit are all powder coated for durability and a long service life.